Lunch al fresco. All photos by Alpana Deshmukh. 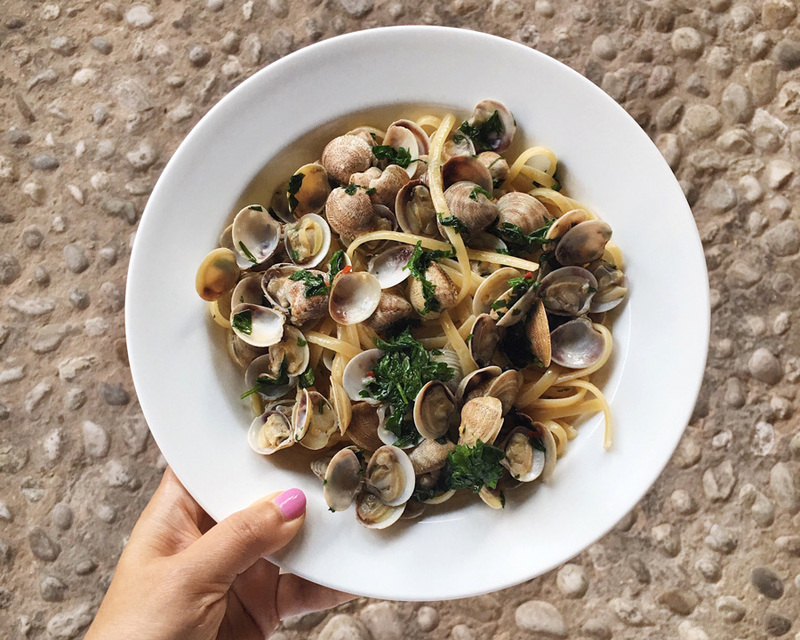 What could be better than eating your way through Italy? Helping the lovely chefs make the meal at a cooking school in a gorgeous Venetian palazzo. 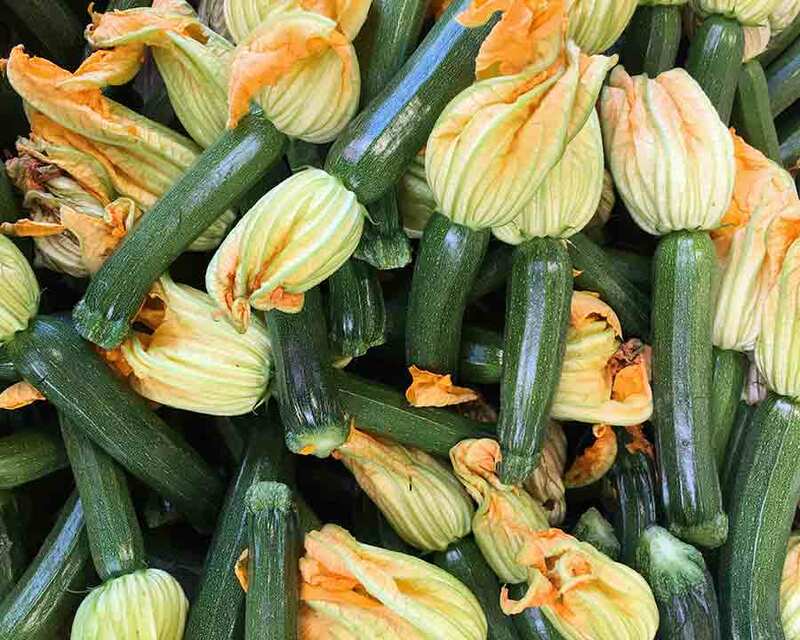 CISON DI VALMARINO, Italy – "Use your core!" she calls out. "Kneading dough keeps you in shape!" Those are motivational words from Sophie Braimbridge, the teacher encouraging me to get physical on the first day of a week of group cooking classes. It's an excellent ice-breaker. There's nothing more bonding than rolling pasta dough — and flexing your abs under your shirt — with seven strangers. 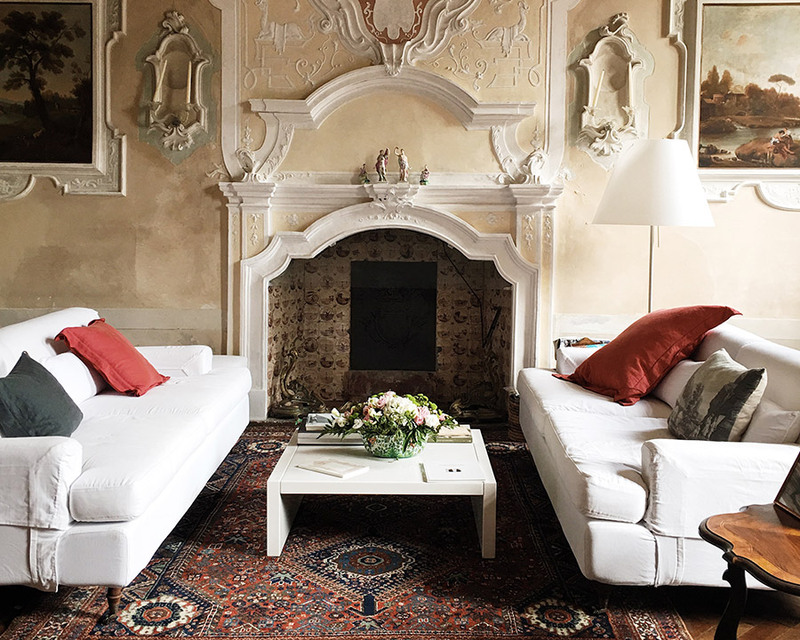 I had joined a six-night residential cooking holiday organized by at , the 15th-century palazzo an hour drive north of Venice owned by Count and Countess Brandolini d'Adda. This was a holiday I had enjoyed previously and was happy to book again. Why repeat it, you might ask? Well, for so many reasons. 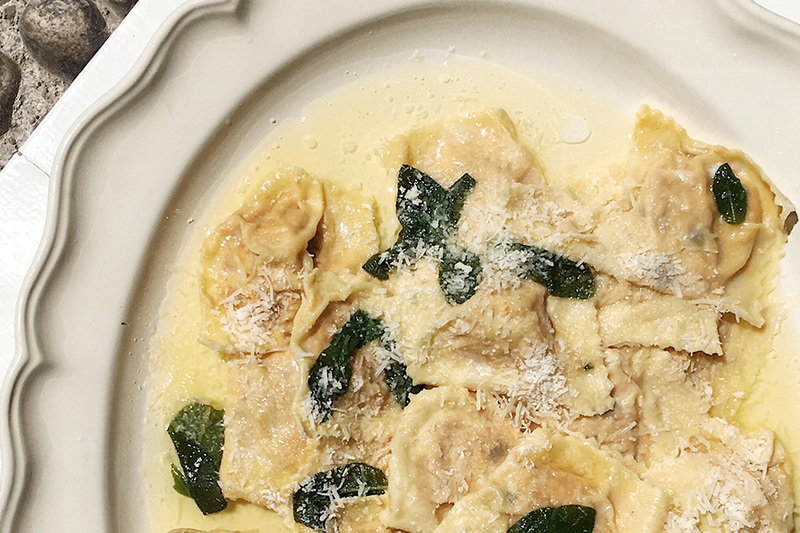 To be creative with hands-on classes using the best seasonal and regional ingredients — without worrying about the washing up (grazie, in-class helpers). To discover the excellent local award-winning wines. 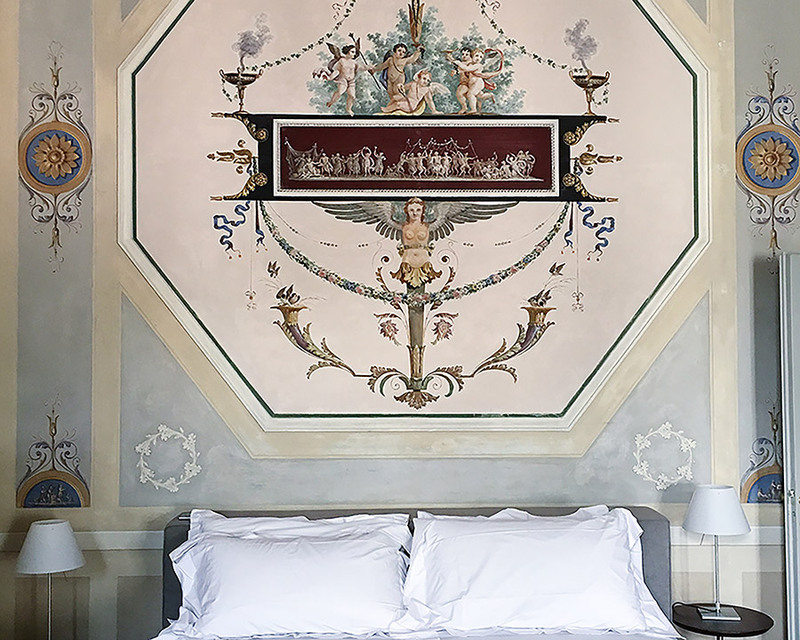 To stay in a beautiful, antique-filled private palazzo setting with two acres of grounds to explore and an unending supply of Instagram-worthy spots. To be with a crowd of always fun guests and team. To bond with like-minded people over our shared interest in food and travel in convivial surroundings. Stirred cultivates a relaxed atmosphere, where all levels of cooking ability and interest are welcome. My springtime group consisted of eight guests from the United Kingdom (myself included), Australia, and Switzerland (a returning guest who told me about the autumnal recipes she had cooked on her last visit). We were cooking under the enthusiastic tutelage of London-based chef Sophie Braimbridge, formerly of the legendary Italian restaurant River Café, Chez Panisse, and author of the cookbook (among others). Later in the week, we were joined by estimable Italo-anglo gastronome guest teachers Rachel Roddy, a Rome-based food writer and author of, most recently, , and Jeremy Lee, chef proprietor at London's Quo Vadis restaurant — both of whom brought deep knowledge, style, and panache to the proceedings. The days started with a relaxed breakfast of local bread, preserves, fresh fruit, cheeses, and prosciutto, after which we'd gather in the state-of-the-art kitchen. Sophie outlined the day's class and the prep required to get lunch and dinner dishes ready. 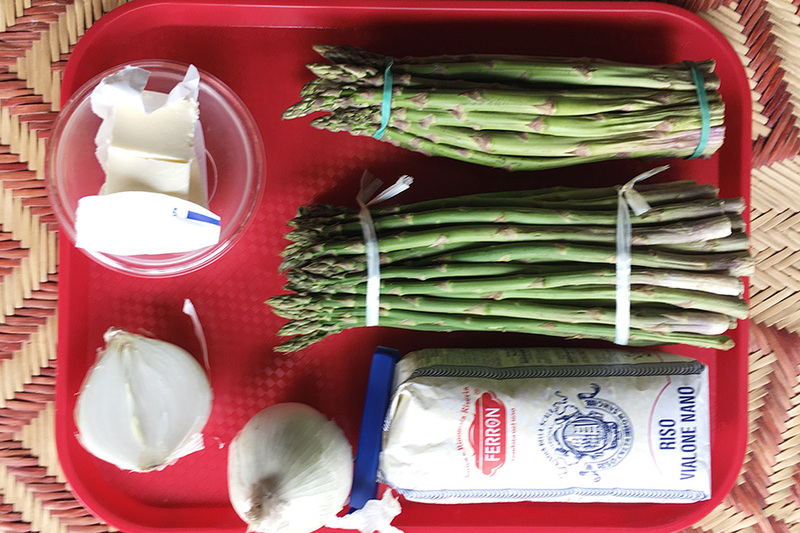 The program's no-stress approach meant that ingredients and recipes were always measured and neatly set out on trays for us by the unflappable assistant, Amanda. (If only she could have followed us home…) The mornings progressed with demos and top chef tips from Sophie, like how to hold a knife and how to perfectly line a baking tin with parchment paper (fold it like an airplane). Miraculously, all the separate and seemingly unrelated recipes and steps came together as delicious dishes when we sat down for our al fresco lunch. I say miraculously, but, in truth, it might simply have been the alchemy of Sophie and Amanda working their magic to ensure our meals were always ready on time and beautifully presented and ridiculously tasty. We students savored our long and leisurely meals under the former silk mills with views of the rose garden. Birds chirped overhead. The sun streamed across the cobbled patio. Wine poured freely. Sophie brought out a basket of cherries to nibble. Bliss. 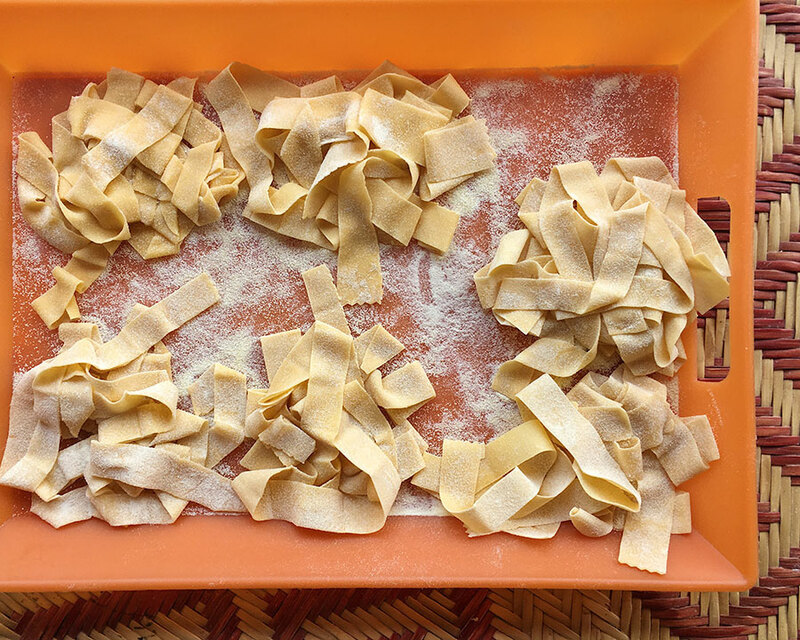 Fresh pasta. The best kind. 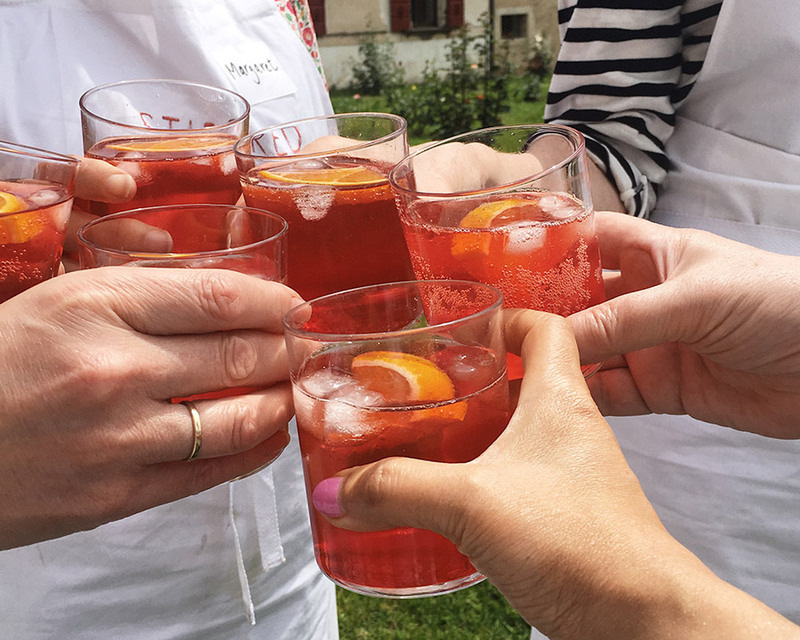 Salut with a spritz between meals. Evening classes began around six and ended when we sat down for dinner a few hours later and were punctuated by aperitivi. Glasses of Venetian Spritz, Campari, or Bellini would appear as we poached the apricots for dessert or took turns to stir the risotto. I loved our dinners — relaxed, candlelit affairs with animated chatter about the day's activity, travel tips, stories, ideas on entertaining at home, and foodie films to watch. Where do you stay in Palermo? You must watch Susanne Bier's , it will make you want to stroll through a lemon grove. Favorite stately homes and gardens to visit in England. At our table, Anglo and American geopolitical turmoil were overlooked in favor of the writing of Elizabeth David, discussions on favorite comfort foods (spaghetti with tomato sauce is mine), and films that inspire travel. I kept a running list of all these on my iPhone and have added , , and to my movie queue. The week's thoughtfully paced itinerary included special events such as a private prosecco wine-tasting, culminating in sabrage using the Count's antique sword. We took a trip to visit and taste the goods at , a local, artisanal, award-winning cheese maker. 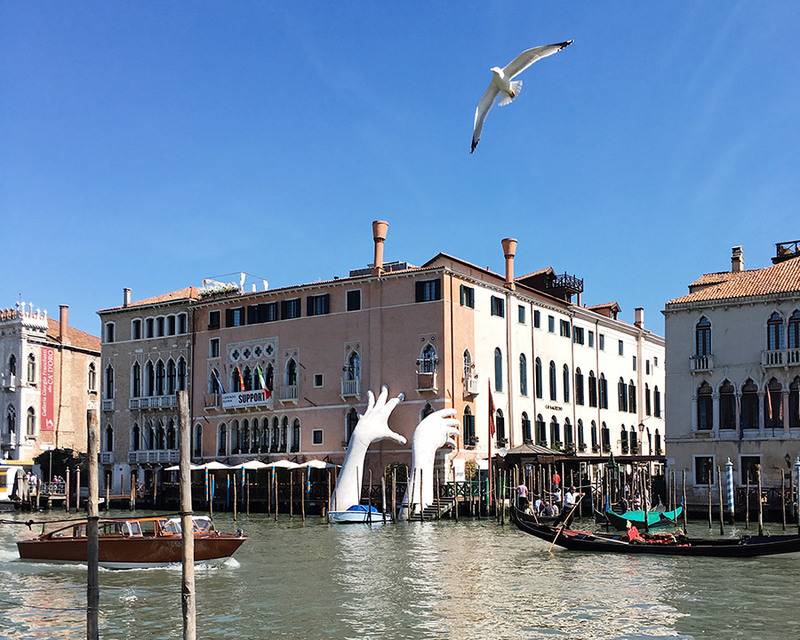 A day trip to Venice filled with so many pinch-me moments: sipping cappuccino, watching the gondoliers, walking the Rialto food and fish market, and shopping with locals. When we picked up produce for class, I wondered why homework wasn't always this good. The pool and patio at Villa Casagrande. Sitting room inside Villa Casagrande. Wall fresco in the bedroom. Modern art meets centuries-old walls. A high point of the holiday was the venue itself. Villa Casagrande, with its distinctive deep red door and shutters, sits proudly in the main piazza of Cison di Valmarino. This gorgeous palazzo has a homely feel, despite its grand size and décor. The d'Addas were not in residence when we were there, and we were left to enjoy the common areas — to browse the light-filled library, play billiards, take off for quiet time in one of the sitting rooms. 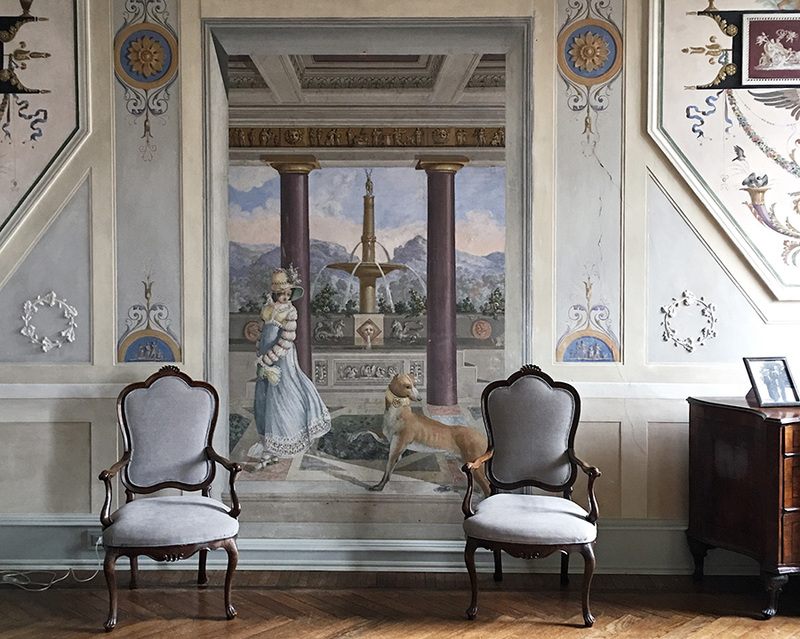 The villa, which is filled with personal photographs, books, and mementoes, is an attractive mix of frescoed rooms, stucco, antiques (Murano chandeliers, precious glass, battle pennants, and swords), and contemporary furniture by acclaimed Italian architect and designer Gae Aulenti. I particularly loved the abstract paintings by the Count's mother, an artist who previously exhibited at the Venice Biennale. Seriously, this is the way to have a vibrant house party. My cooking holiday was so much more than learning how to chop an onion or make polenta — although we did cover both and more. I felt like I was immersed in the local culture. I met neighboring producers of top-quality food and wine. I shopped the markets. I learned about the region's history and customs. The village of Cison di Valmarino, which has been voted one of the most beautiful in Italy, was bedecked in Italian flags during our stay in celebration of the Festa degli Alpini, in honor of the contribution made by the region's residents during WW1. It was an inspirational slice of Italy with a topping of conviviality. 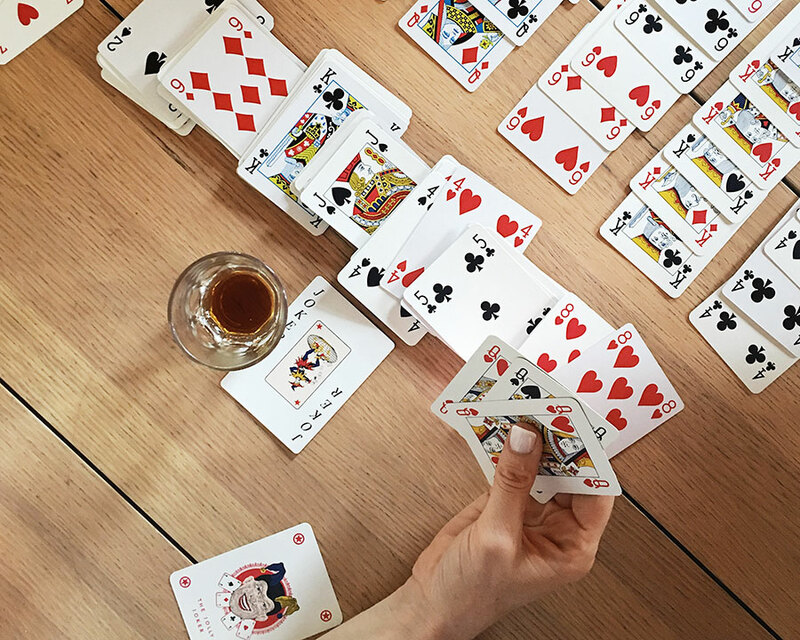 I left with a renewed confidence in my cooking abilities (prawn risotto and home-made mayonnaise are now firmly in my repertoire), an appreciation for canasta, new friends, and truly happy memories. Most guests arrive at the airport in Venice (VCE) for the group transfer that's included in the trip; it's an hour north to Cison di Valmarino. Transport for all trips and excursions on the schedule are arranged by Stirred Travel; anything else is accommodated by friendly local taxi drivers. The seven bedrooms in the Palazzo are spacious and individually decorated with views of the gardens or the village piazza. The scheme blends antique furniture and original features with contemporary designer pieces, charming family photos, and fresh flowers from the garden. It's wonderful to wake up, open your eyes, and see 17th-century frescoes. Each bedroom comes with Italian designer linens by Society, Wi-Fi and iPod docks, and a private, beautifully appointed modern bathroom. Price for 2017 is £2695 per person based on two people sharing a room. There's a £250 supplement for solo travelers. The season at Casagrande runs from April to end of November with a mix of scheduled weeks and bespoke group trips. 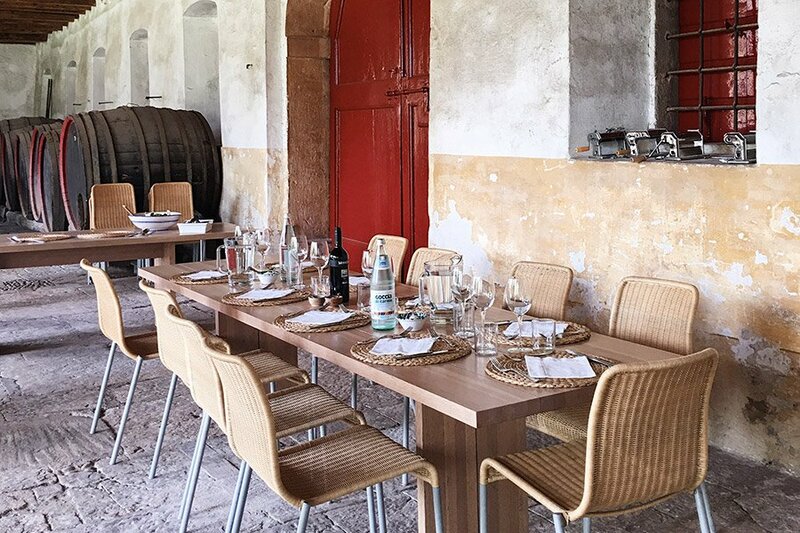 Stirred operates private, tailor-made culinary holidays throughout Italy and beyond year-round.